For the most part, alcohol and drug prevention has not been high on the agenda of most development organizations and programmes. Find more background information in "Alcohol and Development" here. Alcohol and drug prevention has not been high on the agenda of most development organizations. A new booklet from FORUT provides tools that will help development NGOs to integrate substance use issues into their programmes; whether their fields of interest be gender equality, HIV/AIDS prevention, poverty alleviation, community development, or other development issues. 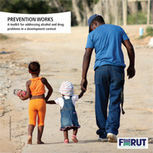 You can view the booklet “Prevention Works” here. A pdf version of the booklet can be downloaded here. The harmful use of alcohol can have a dramatic impact on the lives of ordinary people; not only the drinker, but those in his family or social sphere are just as likely to suffer the consequences of alcohol consumption. Such circumstances are probably not new to most development NGOs, which have experienced the negative consequences of alcohol or drug use in their project areas or among their target populations. Alcohol and drug use is one of the most powerful contributing forces helping to generate development problems such as ill-health, gender-based violence, poverty and the spread of HIV/AIDS. In some project areas alcohol use might impair the expected results of a programme or even nullify them. A week’s income spent by a father in the local bar, sometimes even before pay-day is over, would leave the rest of the household without funds for bare necessities such as food, clothing, and health care. Surprisingly, for the most part, alcohol and drug prevention has not been high on the agenda of most development organizations and programmes. This booklet provides tools that will help development NGOs to integrate substance use issues into their programmes; whether their fields of interest be gender equality, HIV/AIDS prevention, poverty alleviation, community development, or other development issues.